30 Day Money Back Guarantee!!! If this is not the best shifter you have ever used, or you are not completely satisfied with the product, send it back for a FULL refund. Hey Guys, This is our New shifter for the 2011 Mustang. I know most of you have not heard of our company before, so let me tell you a little about us and our products. When we designed the shifter for the 2011 Mustang we ran into quite a few snags along the way. We wanted the shortest throw possible with out sacrificing the shift effort and improving the overall feel and feedback. Our first thought was to machine a single ball pivot like the factory shifter and simply move the point of rotation up for shorter throws. We machined a few different shifters with different throw reductions and found that ONLY 20% throw reduction could be achieved with a single point of rotation do to the closeness of the gates and the reverse lock out. Anything over 20% just simply made the car undriveable. We COULD have settled for 20% reduction, we were all tooled and the CNC machines were setup to run this, we COULD have been the 1st to the market with a shifter back in May, but we decided to toss this design out the window and start all over. After a few months of trial and error, we achieved 40% throw reduction by making a trunnion that tilts on TWO points of rotation. There is one pivot for the front to back throws (1st-2nd) and another pivot for the left to right throws (neutral side to side movement). This allows for shorter throws front to back but does not sacrifice the neutral movement The shifter completely changed the whole shifting dynamic of the car and we knew we had a WINNER. We primarily manufacture parts for the aerospace and semiconductor industries. Most of our work is very intricate and complex 5-axis machining, mainly landing gear components and gyroscope housings for commercial and military aircraft. We are car guys and have always been, so we decided to mix our knowledge of machining and engineering with our love for American Muscle. We kicked off our first product in October of 2009. 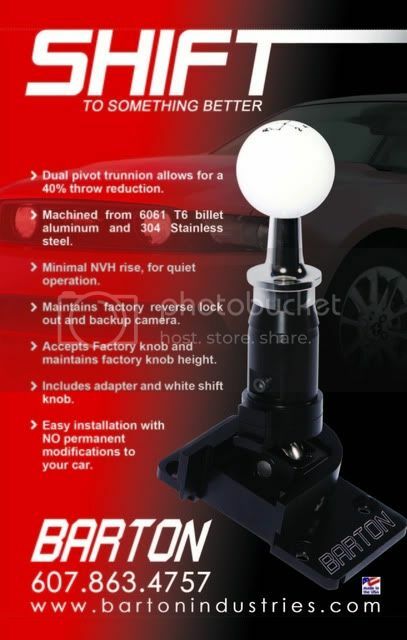 It was the BARTON short throw shifter for the 2010 Camaro, it has been and continues to be a huge success. Our goal is to provide our customers with the BEST products and customer service in the industry. Last edited by Barton Industries; 12/15/10 at 06:50 AM. That looks like a real nice piece. Just noticing your area code, are you in Cortland, NY? Where at? I was just checking out your sight. Yeah, my family is from Cortland "Biviano" but I live in Ohio. It looks like you don't have any 05 Mustang products, but I'll look for an opportunity to support the business in the future! Stay warm and get the snow blower ready. HAHA I'm not looking forward to the snow at ALL. Ive heard the name but not sure I know them. I would love to do something for the 05-09 Stangs but that means I need to buy one. I don't believe in designing something from a borrowed car. I want to drive it and feel it everyday to make sure the product is right. Who knows maybe we will pick one up over the winter and get something going on it. Guys we have installed many of Bartons shifters in the 2010 Camaros and they are by far the best shifter out there. If these are half has good as the Camaro they are twice as good as anything else on the market right now and at great pricing. We have 10 shifters left on our shelf. Get your orders in today and we will make sure its there in time for Christmas.